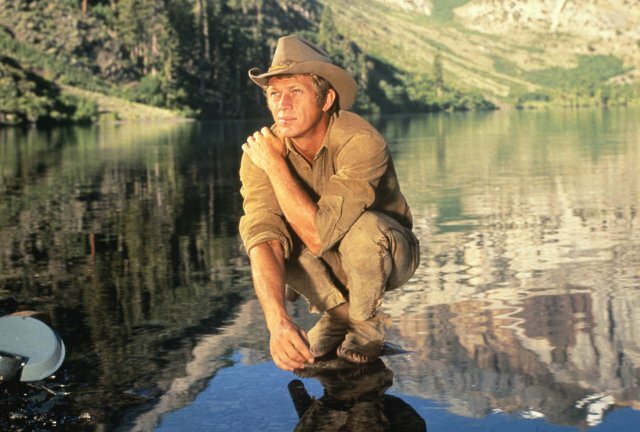 NEVADA SMITH—–Steve McQueen as ‘Max Sand’, alias ‘Nevada Smith’, has a heart-to-heart with a Mexican priest, played by Raf Vallone—SMITH: There’s only one thing important to me. PRIEST: Finding and killing a man. Primitive, hopeless revenge. SMITH: I’ll settle for that. PRIEST: Why, when there is another half of you, waiting to be discovered? You also inherited the refined traditions of religion, philosophy and conscience. SMITH: I don’t understand them words. Lot’s of fun/tough/dumb western dialogue in this trashy, nonetheless compelling saga, spun off from a character in The Carpetbaggers. McQueen doggedly searches the land for the three men who brutally slaughtered his parents. He dispatches them, each in their turn. with appropriately vicious relish. 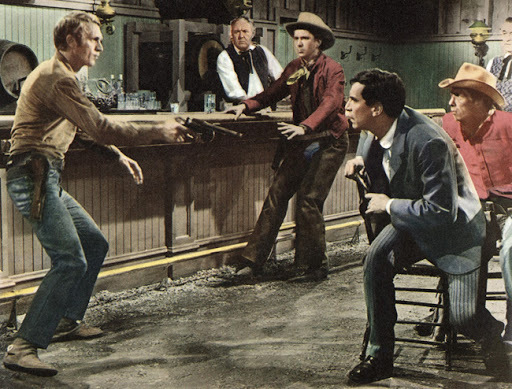 An episodic, simplistic script, often hard to swallow, it’s directed with grit by ornery veteran Henry Hathaway, photographed in beautiful color by Lucien Ballard. Good sound effects put the hammer down, and the music score from Alfred Newman has an effectively haunting shade. 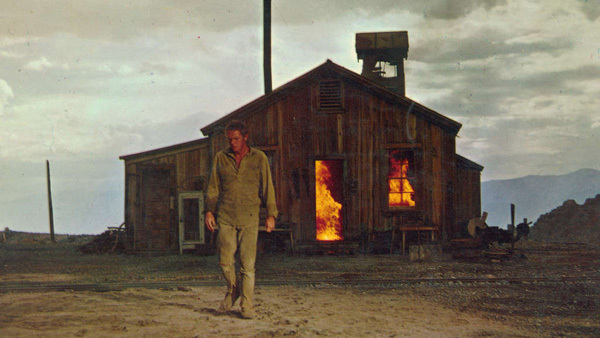 McQueen fits the bill as a lean, tough hombre, though his early scenes, where he plays a youth (supposed to be a teen when he was 36) are mannered and overdone. What makes the mean brew boil is the excellent supporting cast, especially Karl Malden, Arthur Kennedy and Martin Landau, playing it big as the bad guys: a out & out, irredeemable collection of ditch-slime. 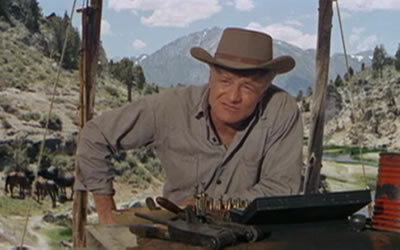 Brian Keith has a brief, welcome role as Smith’s gruff but kindly mentor. In another direction, stinko, is Suzanne Pleshette as a hot-to-trot Cajun that Nevada meets during an adventure in a Louisiana swamp: the entire sequence is ridiculous. The alluring actress hadn’t yet found her metier (in comedy), although the screenplay does her no favors here. In all, a mixed bag, the good points more than enough to warrant viewing from action & western fans, the comic-book scripting and nonstop nasty violence enough to warn others away. Critics didn’t like it, audiences shelled out $6,500,000. 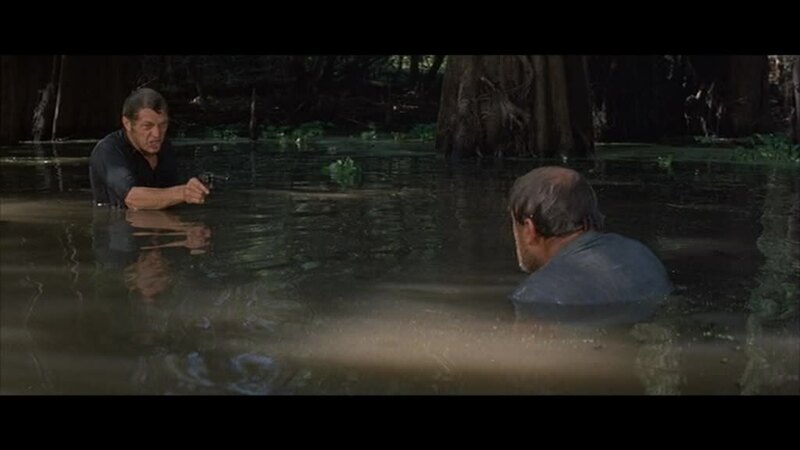 Cameraman Ballard had some great locations to play with in the Sierra’s. Hathaway filmed a lot up there, as far back as the mid-30s and Lives Of A Bengal Lancer, up through the 60s, in North To Alaska and True Grit. The 128 minutes are packed with character actors—Janet Margolin, Pat Hingle, Howard Da Silva, Paul Fix, Gene Evans, Lyle Bettger, John Doucette, Bert Freed, Val Avery, Ted de Corsia, Stanley Adams, John Litel, Strother Martin, Iron Eyes Cody. You need peepers like Superman to spot hopefuls Loni Anderson and Edy Williams. Look for the scene where Smith almost gets trampled by a loosed cattle herd: McQueen had no stunt double and nearly got crushed for real.